This page is intentionally left blank. To print a goal from your Library, view the saved version of the goal and click on "Print this goal." Peer Interviews are three rounds of discussion where one student interviews a peer about a specific topic while a third student observes and takes notes, with the students rotating the role of interviewer, interviewee, and reporter for each round. Before the activity begins, the teacher assigns initial roles to students in each group using “role tags” (e.g., each one separately labeled). Once a topic is introduced, students are given a few minutes to brainstorm and generate thoughtful interview questions. Each interview lasts 3-4 minutes, and students are provided with an extra minute between roles to prepare for the next one. The teacher uses a cue, such as “Role change!” between interviews to signal students to pass “role tags” to the right. After all three interviews have been conducted, students share their observations and notes with each other in their small-groups in order to consolidate their findings. A collection of sentence starters for responding to literature. 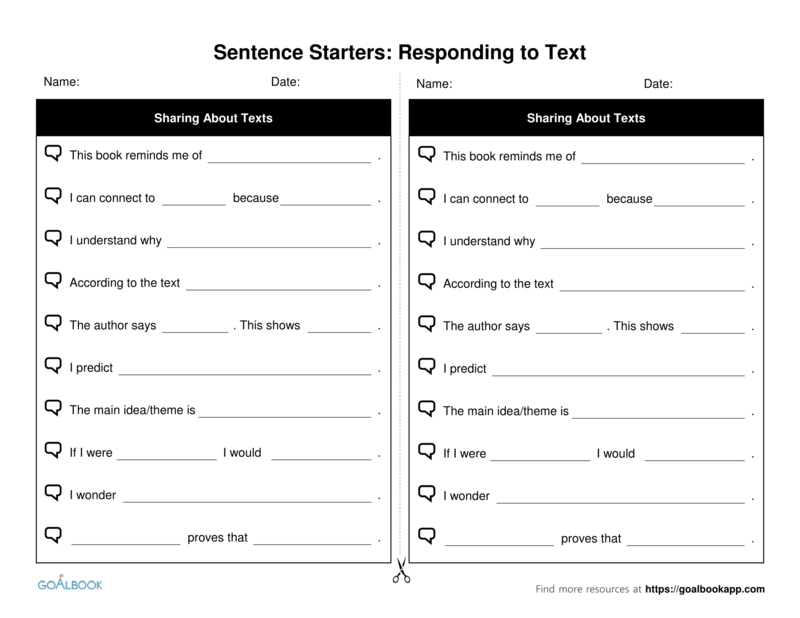 Use these sentence starters to support students while writing, participating in group discussions, and preparing for presentations. 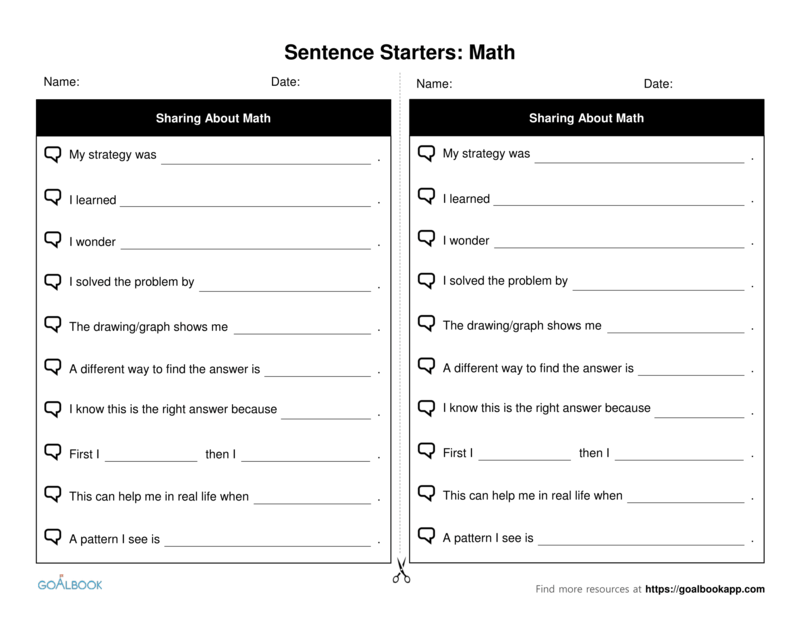 A collection of sentence starters for mathematical reasoning. Use these sentence starters to support students while writing, participating in group discussions, and preparing for presentations. Download opened in a new window. The resource was opened in a new window. If you did not see a new window, please disable any pop-up blockers and try again. Resources can be downloaded with a membership to either Goalbook Toolkit or Goalbook Pathways. Goalbook Toolkit guides educators working with specialized student populations to vary the levels of instructional support. Goalbook Pathways combines research-based resources, strategies, and training so that educators can design multiple pathways for ALL students to succeed. You must have an active membership to download resources. If you have membership through your school, contact your administrator about renewing your membership. You have already used all of your available downloads for this month. If you believe this to be an error, please contact support below or at support@goalbookapp.com. Create an recording sheet that each group can use to record questions and answers from all three interviews, or print out this [[ https://tucek.wikispaces.com/file/view/graphic%20organizer%2018.jpg/457506246/800x585/graphic%20organizer%2018.jpg | free version ]] of a three-column chart, to support organization and help students develop active listening and note-taking skills. Prepare “role tags” for each group by writing each role using large, bold lettering on separate pieces of sturdy paper (e.g., cardstock, large index cards). Fold each one in half to create a standing placard. To minimize confusion, also use different colored paper to signify each role. Explain that students will be participating in a number of interviews from a variety of perspectives (i.e., Interviewer, Interviewee, Reporter). Model how how to role change between sessions using three students to demonstrate (e.g., “When the group hears the signal, they will pass their “role cards” to the right.”). Familiarize students with the method of interviewing by teaching students the difference between open-ended questions (e.g., require a greater answer than a single word or two) and closed questions (e.g., can be answered with “yes” or “no”). Provide sample questions or question stems to support students in forming open-ended questions for interviews. Give sentence starters to help students generate responses as interviewees. Sentence starters provide support to students who face barriers with expressive language or task initiation by giving students more opportunity to focus on the content of their responses rather than the structure. Promote equal participation and provide students with the same amount of time to voice opinions by timing each session of the activity (e.g., 2-3 minutes to prepare thoughts and questions before interviews begin, 3-4 minutes to ask and answer questions during each interview, 1 minute to prepare between roles). Ask students to create a culmination project after all interviews have been conducted and reporter notes have been shared to represent the group’s thinking (e.g., create a collage, math model with labels, poster). Use this strategy periodically (e.g., at least once during a content unit) to enhance student engagement and interest. Modify the purpose of the interactions, such as activating prior knowledge (e.g., get to know you interviews), critical thinking (e.g., word problem analysis), or for review (e.g., informal assessment). Deepen student questioning skills overtime by introducing different levels of thinking, such as this [[ https://notjustanybrickinthewall.files.wordpress.com/2012/09/askin-thinking-qs.png | outline of Bloom's Taxonomy ]], to extend student questioning abilities (e.g., asking critical thinking questions that help students create, evaluate, analyze, apply, understand, or remember information). While launching a unit on mythology, a teacher asks students to participate in a Peer Interview in order to activate and gauge students’ prior knowledge. Small groups are created (e.g., three students in each group), and “role tags” are distributed (e.g., Interviewer, Interviewee, Reporter). The teacher reminds students what each role entails and asks them to listen for cues to indicate when roles will rotate. A timer is set for 2 minutes, allowing students to generate open-ended questions for interviewing (e.g., “Ask questions that will guide your interviewee to share what they already know and want to know more about.”). Next, interviews take place (e.g., 3-4 minutes for each round with students switching roles). Lastly, group members share and compare information to summarize their interactions. To support students in expressing their thinking while solving math word problems, a teacher has students participate in a Peer Interview (e.g., “Today in our groups of three, we will expand our math vocabulary and share our opinions about efficient solving strategies!”). Each group is presented with a multi-step story problem. All students are provided time beforehand to solve the problem, and then interviews begin to review student solving strategies. Throughout the activity, students voice their opinions and practice active listening skills (e.g., Q: “How did you know your answer was accurate?”/ A: “Similar to Lily, I used a model to check my answer.”) After, the group discusses which strategies were most efficient. After reading [[ http://prodimage.images-bn.com/pimages/9780439206372_p0_v1_s1200x630.jpg | The Recess Queen ]], by Alexis O’Neill, a teacher explains that bullying can often be stopped based on how others react. Next, the teacher tells students to consider some bullying scenarios (e.g., getting picked on or threatened, being pressured to try drugs). Using the Peer Interview strategy, students are asked to find out how their classmates might feel or react if they were the victim in these situations. As each member of a group assumes different roles (e.g., Interviewer, Interviewee, Reporter), students discuss how these situations can be resolved. After, each group consolidates the information by choosing from a list of presentations (e.g., create an anti-bullying poster, plan a skit to model how to respond to a scenario). Resources can be accessed with a district or school membership.